I thought LottoPark had potential initially, but the closer I looked, the more evident the cracks became. I had high hopes the moment I saw LottoPark’s website. It’s simple, but it gives you the impression that they are serious about lottery. In a way, they are—what with impressive language options, good prices and even well-thought out educational materials—but LottoPark misses the mark on a lot of things. What are those? Join me below as I take a deeper dive! LottoPark’s game offerings aren’t impressive—in fact, they’re quite limited. After all, you only have 7 lottery games to choose from, namely: Powerball, Euromillions, SuperEnalotto, Eurojackpot, Mega Millions, UK Lottery and Polish Lotto. It’s good that they offer the biggest and most popular games around—which is more than enough for some people—but more options would have been better. They don’t even have other game types available. Syndicates, raffles—heck, even scratch cards—are nowhere in sight here. So far, their only saving grace is their prices. Part of the reason why LottoPark’s prices trump theLotter’s is that they let you buy only one ticket line at a time. A lot of lottery sites require you to buy a minimum of ticket lines, but not LottoPark. 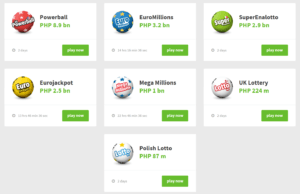 Compared to other lottery sites, LottoPark’s accepted banking methods are lacking. LottoPark only accepts 7 deposit methods, such as: Visa, MasterCard, BitCoin, Neteller, Skrill, Cubits, tpay.com, and Sofort. LottoPark also adds wire transfers to the mix, as far as withdrawal methods go. Make no mistake though, it’s a decent enough assortment of deposit methods, but players from certain parts of the world might get alienated by the lack of variety. What if these payment methods aren’t that popular where they live? Sure, they can easily apply for some of these e-wallets, but that’s another step that most people might not be too keen to take. For the most part, LottoPark is quite secure. For starters, they utilize SSL encryption technology to secure user data and transactions. You also don’t need to worry about legitimacy because LottoPark is licensed and regulated by the Curacao government. LottoPark is quite serious about player anonymity. They will only request personal data from you if you win—which is for verifying your identity to ensure the winnings get transferred to the right person. If you don’t win anything, you stay anonymous. It’s not a big feature, honestly—but it should satisfy those who prefer to stay anonymous (for the most part, anyway). LottoPark’s customer support options are quite decent—if a little lacking. The FAQ’s, for instance, give a good overview of their services, what their banking methods are, and even how they stand out from other lottery sites. It’s informational, but not too densely packed that it becomes overwhelming. Sure, it could use some more meat—but as it is, LottoPark’s FAQ section gets the job done. As for getting in touch with their support, you can give them a call, send an email, or leave a message on their online contact form (which is strangely in Dutch, even if the rest of the site is in English). They also provide their business address. Finally, if you were hoping for a live chat feature, you’re out of luck. LottoPark’s education materials are spot on—it might be one of the site’s strong suits. Each lottery page is brimming with information. If you wanted to, say, learn about the history of a particular game, LottoPark has got you covered. If you wanted to learn how to play a certain game, they also have that on tap. You can also learn what a game’s odds of winnings are, what the draw dates are, and even catch up on the latest news regarding each lottery game. Another are where LottoPark shines in is their ease of use. LottoPark’s website is quite simple. The design is minimalistic and pleasing to the eyes, and the focus is squarely on the lottery games—no gimmicks here. One other thing that I liked was how, for the “big three” lottery games (Powerball, Mega Millions & Euromillions), you can make a 3-line quick purchase right on the navigation menu. If you’re in a particular hurry, or if you simply want the easiest way to enter these three games, then this feature could prove quite useful. 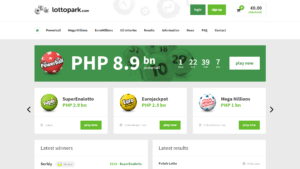 Creating a LottoPark account is incredibly easy and fast. LottoPark’s no-nonsense sign up form. 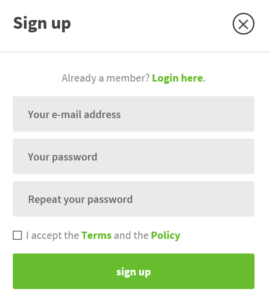 Click on the green “Sign Up” button located at the top right corner of the website. Complete the registration form simply by providing your email address and your account password of choice. Verify that you accept their terms and policy. Click on the green “Sign Up” button to complete your registration. Just like signing up, playing in LottoPark is easy—but some features that usually come standard are absent here. Sign in to your LottoPark account. Add as many lines as you want to play. Or, you can simply play only one line—your choice! Pick your numbers. You can do so manually, or via the Quick Pick option if you’d rather have your numbers picked at random. Click on the green “Continue” button if you’re satisfied with your numbers. Review your order. You can also add more tickets if you want. Click on the “Pay Now” button if you’re all set. Pretty straightforward, right? Unlike most lottery sites though, you can’t subscribe to lottery draws here. The same holds true if you want to manually pick how many draws you want to participate in. It’s the price to pay for sheer simplicity, I guess. Claiming your winnings isn’t as streamlined—nor as easy—as other sites’. Unlike other lottery sites that would call you by phone or send you an email, LottoPark doesn’t automatically notify you if you win. Instead, you’d have to manually compare your ticket with the winning numbers drawn. If the draw date slips your mind? Tough luck. As for claiming your prize, you’d have to send LottoPark an email—complete with your user account name, the name of the lottery, the draw date, the numbers you picked, and the withdrawal method you prefer. Winnings amounting to €10,000 or less can be withdrawn using the 4 methods (BitCoin, Neteller, Skrill or wire transfer). For winnings beyond €10,000, LottoPark will arrange a suitable claims process for each winner. It could be anything from sending you the original ticket so you can claim the prize on your won, to allowing them to claim your winnings for you and having them transfer the prize to your preferred withdrawal method. Oh and, yes, you can request for the original ticket if you want. However, it will cost you. Fees depend on where the ticket will be sent from and where it is being sent to. It’s also important to note that LottoPark does not scan tickets—so this is the only way for you to get a copy of your ticket. It’s purely optional though. There’s a lot of compromises you have to be prepared to make if you really want to stick with LottoPark. Tons of games await you! If you want options, theLotter has got you covered. They currently have a whopping 53 lotteries on tap, plus around 24 group play games and the occasional raffle. theLotter offers various discounts for those who will purchase tickets for multiple draws. They also offer bundles that allow you to purchase tickets for solo games and syndicates in one fell swoop. Plus, they also have a VIP program that gives you the chance to get deeper discounts. As of this writing, theLotter accepts 29 different deposit methods, plus 7 withdrawal methods. This should make it easier for just about anyone to purchase tickets or get their winnings. Their game variety is fantastic! If you want to play in other lottery games besides the most popular ones, WinTrillions’ 20 games, 13 syndicates 4 syndicate raffles and several millionaire raffles should be right up your alley. WinTrillions trumps theLotter in this regard, with over 32 accepted banking methods—which also includes the popular cryptocurrency, BitCoin. WinTrillions only allows you to purchase tickets for multiple draws—which, unfortunately, ramps up the prices. LottoKings’ 19 lottery games includes a good mix of some of the biggest and less popular lotteries around. Not only does LottoKings notify you automatically if you win, they can also claim your prizes for you. To receive your prize, you can request for a check or you can visit any of their offices worldwide to claim it. You can, of course, also opt to claim your winnings on your own. LottoKings only accepts 10 payment methods. That’s still better than what LottoPark accepts though. While I believe LottoPark has potential, I wouldn’t recommend it. For all the things LottoPark gets right, it takes two steps backwards. For one thing, liked how simple its website is—not to mention how accessible it is to people of different ethnicities—but the fact that it’s banking methods are way too limited right now doesn’t do them any favors. I also liked how they don’t require you to purchase a minimum number of ticket lines, but it made no sense why they omitted subscription and multi-draw features. The thing that irked me the most, however, was their prize claiming process. Not only does LottoPark not notify winners if they have won, you’d have to manually submit a claim via email if you want to get your prize. That doesn’t seem to be very customer-friendly. Yes—I liked a lot of things about their service, but the bad definitely outweighs the good in this case. All in all, I suggest you give LottoPark a pass—at least until they get their act together. LottoPark is a lotto agent service that purchases tickets on a player’s behalf. Unlike other lotto agent services, they don’t scan tickets, so they can keep costs—and therefore, prices—low. They are owned and operated by Seymour Marketing Limited, whose online arm Seymour B.V. is licensed and regulated by the Curacao government. It’s cheaper than othrers & Also Euro Million layout is so inspiring. And the exact copy of the retailer Slip Papers.